KGI Securities' Apple analyst Ming-Chi Kuo is known for his amazingly accurate calls on all things Apple. Kuo seems to know in advance exactly what new features Apple is planning on adding to the next iPhone or iPad. The latest note that the analyst sent out to his firm's clients happened to include a hike in the number of Apple iPhone 7 and Apple iPhone 7 Plus units he believes Apple will sell this year. Kuo cites Samsung's problems with its Galaxy Note 7, and the demand for the iPhone 7 Plus as reasons why he has raised his 2016 sales estimate for the new units to a figure between 70 and 75 million; his original forecast called for the sale of 65 million units. Even with the additional sales, this falls short of the number of Apple iPhone 6s and Apple iPhone 6s Plus models sold in 2015. The analyst also says that reports of carrier sellouts and strong demand could partially be the result of carrier promotions for the phones. In the U.S., each of the top four major wireless operators has an offer involving a free 32GB iPhone 7. The analyst also says that Apple has only been able to score a manufacturing yield of 60% to 70% on the Jet Black version of the new phones. This naturally has led to a shortage of the Jet Black models. 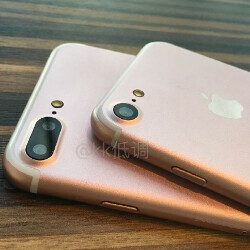 Apple has reportedly told suppliers that it wants to build 100 million iPhone 7 and iPhone 7 Plus handsets in 2016. That is more than the 80 million to 85 million units that the suppliers were expecting Apple to order for 2016. Last week, German researchers GfK investigated the sales channels for the iPhone 7 and iPhone 7 Plus and came to the conclusion that launch weekend sales were 25% lower year-over-year. Still, there are some analysts that are bullish on the new iPhone models. South Korea's Hi Investment & Securities' Song Eun-jeong says that the iPhone could take over the top spot among premium smartphones because of the promotions offered by the carriers. Conflicting stories about the breadth of demand for newly launched iPhone models is nothing new. We will have to wait until next month when Apple releases its next earnings report to get some idea of how the new units are faring. Perhaps more important will be the results of the quarter that ends in December. The results of that three month period, which includes the holiday sales period, will be released late in January, 2017. Yeah why do all the careers offer 'free iphones'? Wouldn't they want to offer android phones with their bloatware on them? I don't like Apple bloatware! you can't put Apple and bloatware in the same sentence. While I disagree with that troll, why bring the S7 here? You're starting to mention Samsung phones more than Samsung fanboys nowadays, geez. I hope you're including your self. Mr "
Carrier bloat must go away. Verizon must stop replacing OEM apps with their own crap. Put it in the App Store. The nerve of them c-suckers. Why Ming Chi when you can rely on Mark Gurman? Any app that an individual doesn't want or use is bloat, whether it be a game or not. I suppose, though by that definition, bloatware is everywhere on all devices regardless of brand, and is not going to go away. Bloatware is an unwanted or unnecessary App or feature. So, bloatware is subjective. Well, so far all reports indicate fewer sales than last year. Yea Tim cook like to exaggerate iphone sales by channel stuffing, but it will have to be a mega channel stuffing! Already Gfk (german research firm) report iphone 7 sales are down 25% YOY in Europe and Asia!! This is completely expected. Stay calm everyone :). Last year's model has a headphone jack. The idea is to get more features or at least more value with an upgrade. Not surprised by the dwindling interest. Who would want an ugly phone with huge bezels? Everyone who's waiting for the new pixel phones lmao but all jokes aside everyone is entitled to what they like. Nah, the new Pixels' bezels, though big, are still smaller than the iPhone's!